More 4 Mom: Win $100 Amazon Gift card, time to shop! Win $100 Amazon Gift card, time to shop! You want to win - RIGHT? Here's your chance! 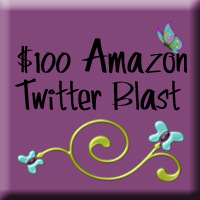 Welcome to the next segment of the $100 Amazon Twitter Blast where you can win a $100 amazon card provided by us to you. Take your time to fill out the form following the Twitter accounts as you go. As long as you have your Twitter name on one of the entry forms, you do not have to put it in all to make it easier for you to enter. Come back do them all, and you get a bonus entry! Are you a blogger that wants in on the fun? You can join in late here to this event, or you can sign up for the other ones combined in with this one at the same rate.